While breastmilk is ideal baby food, many moms struggle with the process breastfeeding, and that’s okay. 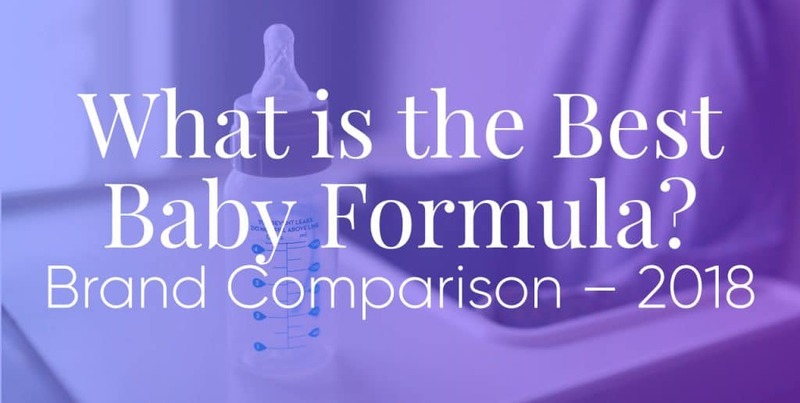 Formula has come a long way, and today we’re going to go over some of the best formulas to try for your baby if you choose. All formulas sold in the U.S. are regulated by the FDA and have to meet certain nutritional requirements. Therefore, any formula you buy will be safe, but you can narrow your selection based on factors such as cost, ingredients, and individual baby tolerance and preference. Similac is a name brand that hospitals seem to favor. While they likely receive free samples to make this the case, it is still a great formula, and Similac has been on the cutting edge of formula research. 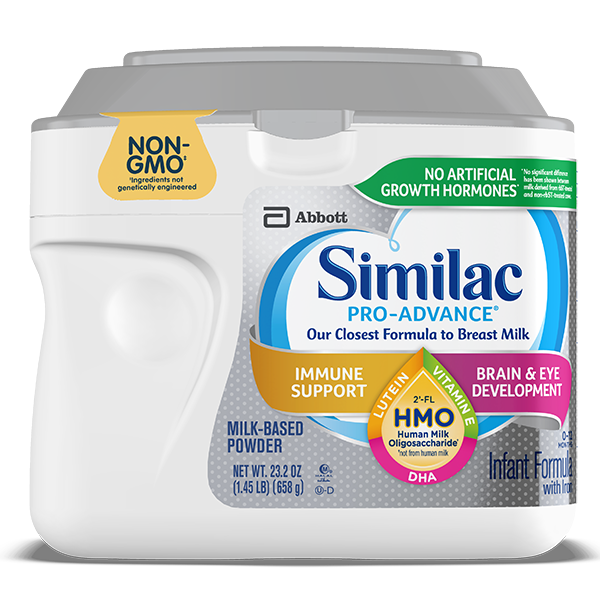 Most recently in 2015-2016, Similac introduced a “Pro” version of their formulas and began putting human milk oligosaccharides (HMOs) specifically 2’-fucosyllactose or 2′-FL into these formulas. Research has shown that 2′-FL helps make the immune system response and the gut flora comparable to breastfed babies… see studies below. Similac states that 2′-FL is the “biggest breakthrough in formula research in 15 years,” and only Similac Pro, Gerber, and certain Perrigo manufactured store bought brands formulas have this compound in them. Similac formulas are also all Non-GMO. Similac has plenty of variants of formulas: Advance (standard milk based), Sensitive (low lactose), and organic options. The only bad thing about Similac formula is that it’s expensive, but that’s because it’s (1) a name brand, and (2) good formula. Costco carries regular Similac formula under their Kirkland brand. Unlike a generic version of Similac, the Kirkland brand is 100% Similac formula and is packaged and labeled in the same factory that produces Similac formulas. Unfortunately, Costco doesn’t have a Similac Pro formula under their Kirkland brand (they only have one regular version), but if your baby likes regular Similac Advance, then if you have a Costco membership you should definitely buy the Kirkland brand because it’s about half of the price for the exact same thing. Perrigo is the largest generic formula manufacturer in the world, and I’m glad to see that they are a U.S. based company 🇺🇸 which means they still follow all the FDA regulations and requirements. Their company was founded 125 years ago by Luther and Charles Perrigo in Vermont, and in addition to formula, Perrigo also manufactures generic drugs, so you may have already purchased their products in the past. Perrigo partners with and sells their store-bought brands in the following retailers under their store brand: Walmart’s Parent’s Choice brand, Target’s Up & Up brand, Kroger’s brand, Aldi’s brand, CVS’s brand, Sam’s Club brand, Walgreen’s brand, Rite-aid’s brand, and possibly more. So if you are looking in any big box store for a store-bought formula, you’re probably buying formula manufactured by Perrigo. Perrigo makes generic brands of Similac, Enfamil, and Gerber, and in addition to making generic regular Similac, they also make a generic Similac Pro with 2′-FL HMO. Out of all the big box store brands, interestingly, Walmart is the only one carrying Perrigo’s Similac Pro generic formula with 2′-FL HMO. All of the other retailers are only carrying the regular Similac generic version including Target, Kroger, Aldi, Walgreens, Sam’s Club, CVS, and Rite-Aid. Walmart’s Parents Choice currently offers two Similac generics: Advantage (based on Similac Pro Advance) and Sensitivity (based on Similac Pro Sensitive), and both are based on the Pro versions and have 2′-FL HMO, which is awesome. And not only does Walmart’s carry the best generic Similac, but they also have the lowest price out of all the other stores carrying Perrigo! Highly recommend! I’m not a fan of Enfamil. I have read numerous horror stories in customer reviews, and when looking at the formula sections in stores, you always see a full stock of Enfamil… maybe because no one seems to buy it. The ingredients list is also suspect when compared to Similac and other formulas, and one can see that Gentlease’s first two ingredients are corn syrup solids and vegetable oils. Gentlease is Enfamil’s sensitive formula. It has partially broken down proteins and reduced lactose to help with gas, stomach upset, colic, etc. The issue with Gentlease (aside from horror stories), is that it still has lactose in it because it uses nonfat milk solids instead of only a milk protein isolate which removes the lactose. Being a name brand, Enfamil products are also equally as expensive as Similac and Gerber. But for not having modern ingredients in any of their formulas such as 2′-FL HMO, they are quite bold in their pricing strategy. One might wonder how Enfamil is profitable despite producing subpar formulas that nobody seems to buy off the shelves, and it would appear that they participate with WIC, which might explain their revenue source. Perrigo makes store-bought generic versions of all formulas, including standard Enfamil formula, and Gentlease. However, the Perrigo brands may be similar to Gentlease, but the ingredients list doesn’t match up super closely as they do for other generics like Similac. So if your baby is on Gentlease and you want to save some money buying a Perrigo store-bought brand, you can give it a try, but it might not work out. Gerber is good, but like Similac, it’s expensive. Otherwise, it’s quality formula, with Non-GMO, 2′-FL HMO, and hydrolyzed (easy to digest) milk protein isolates. They also have tons of variants for protein source (milk, soy, etc. ), organic options, sensitive options, etc. Of note, Gerber also makes great probiotic drops to establish good gut bacteria for better digestion, and you guessed it, they’re also expensive.